Sen. Bernie Sanders (I., Vt.) said on Saturday the Center for American Progress and its affiliated blog ThinkProgress were a “counterproductive” force in the effort to beat President Donald Trump, an attack against a liberal think tank his top campaign officials were previously affiliated with. 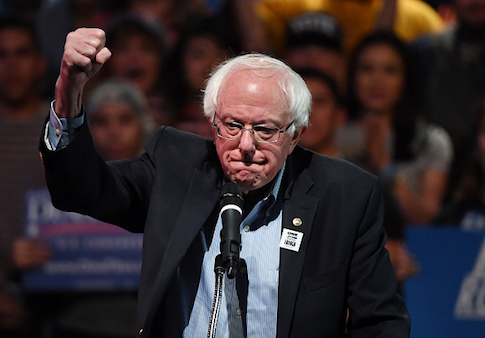 Sanders’ “deep concern and disappointment” in the group was expressed in a Saturday letter to Center for American Progress board members in which he complained about what he called “personal attacks” and efforts to “smear” him and other 2020 candidates. The letter, published by the New York Times, was emailed to the liberal group by Sanders campaign manager Faiz Shakir, who launched the ThinkProgress blog and served as its editor in chief. Also previously employed by the Center for American Progress was the campaign’s top foreign policy adviser Matt Duss, who was the liberal think-tank’s Middle East director and a frequent byline on Think Progress. Center for American Progress president Neera Tanden, a frequent critic of Sanders supporters who is called out directly in the Sanders letter, responded by asking for a meeting with Shakir to discuss the “unfortunate” situation. The article that most directly led to the letter from Sanders labeled him a “millionaire” and “one-percenter.” The blog also produced a video on his “millionaire problem,” arguing that his attacks on the rich have been watered down as his own wealth increased. The Center for American Progress was founded by John Podesta, who chaired Hillary Clinton’s failed 2016 campaign. It is funded by both large corporate donors and also liberal billionaires such as George Soros. The post Bernie Sanders Attacks ThinkProgress, a Liberal Blog Launched by His Campaign Manager appeared first on Washington Free Beacon.